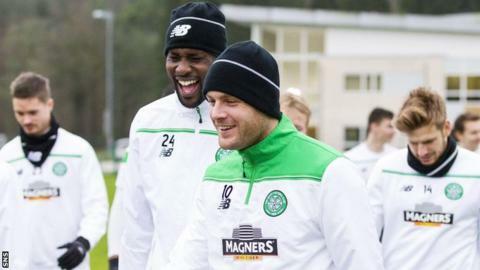 Striker Anthony Stokes has told manager Ronny Deila that he wants to stay and fight for his place at Celtic. The 27-year-old Irishman returned to training this week following a two-week suspension after expressing on social media his anger at being sidelined. "He loves Celtic and he wants to stay here," said Deila, saying it was "important" that he indicated his desire to win back a starting place. "But he also understands that he needs to improve certain things." Stokes, who signed for Celtic from Hibernian in 2010, has only made two appearances this season, the last being in a 3-1 win over Dundee United in August. He spoke out after being left out of the 18-strong match-day squad despite travelling last month to Inverness for a Scottish Premiership match. But Deila stressed afterwards that the suspension was the result of a culmination of issues with the striker. And, ahead of Saturday's visit by Motherwell, Deila insisted: "I love Stokesy, I have nothing wrong to say about him, but this is a professional football club and we want to get the best out of everybody." Stokes will miss out again as Celtic aim to protect their four-point lead over Aberdeen at the top of the table. "Motherwell is going to be too quick," said Deila. "He has not trained for a couple of weeks, so he needs time to show and again, this is to show over time, it is not about one week, it is about changing over time. "We have had a talk with him, he is humble, an intelligent guy. "He knows what I expect and the changes he needs to make to be part of the first team or the squad and we have to see through time if those changes are going to be made. "He has apologised. I talked to him before, so this is nothing new. "We had to make a mark, we did it and now we move on." Deila hoped that Stokes, who is out of contract in the summer, could still contribute to Celtic's bid for a domestic treble. "He has ability and, when you have ability, it is about getting the best out of it and that is my task," added the manager. "I will never give up. "I believe that people will change. I believe that people want to get better and then I have to do everything I can to get out their potential. "If we can get the best out of Stokesy, everybody knows that we have a great player."